Combining clean lines with traditional craftsmanship, this pair creates a demand for South African design. 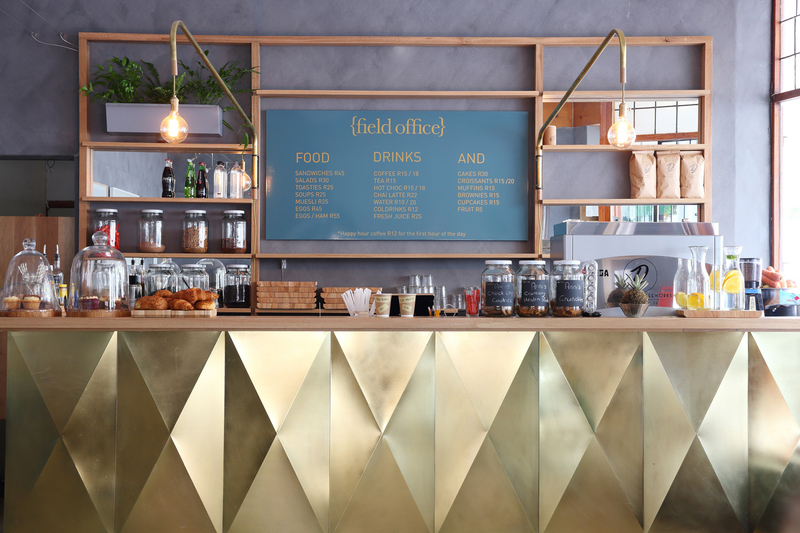 Pedersen + Lennard’s Field Office coffee shops, including one at the Woodstock Exchange in Cape Town, were conceived as hangout spots that would double as showrooms for the duo’s furniture. 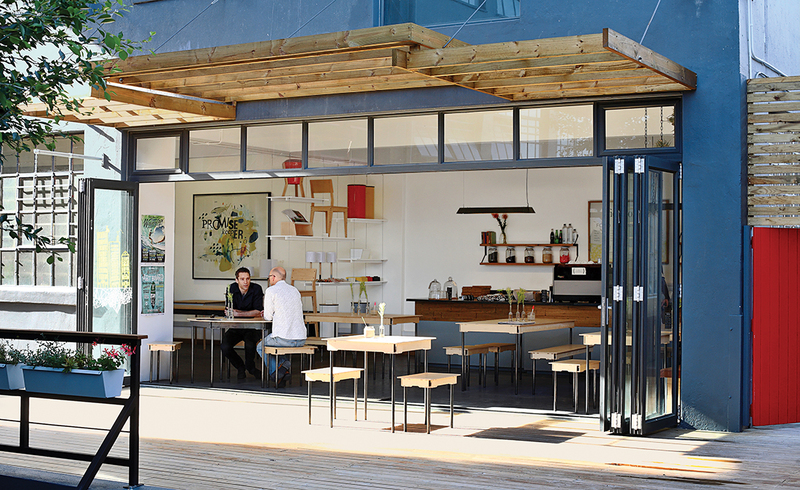 Lennard and Pedersen display and sell their furniture in a retail space attached to their Field Office coffee shop in the Woodstock Exchange in Cape Town. The Bucket Stool proved an early and enduring hit. Introduced in 2008, the Bucket Stool "was inspired by our desire to combine handmade and precision-cut elements, as this best describes the juxtaposition of craft and design in South Africa," Pedersen says. "The buckets are handmade in townships around Cape Town by craftsmen who have been working with sheet metal for generations. Each bucket is cut out by hand and hammered into shape with the most basic and ingenious of systems, along with our plus-sign logo. The legs and seat are CNC-cut from Scandinavian birch plywood, and the seat flips over to function as a side table. We have two models, a regular stool and a barstool." 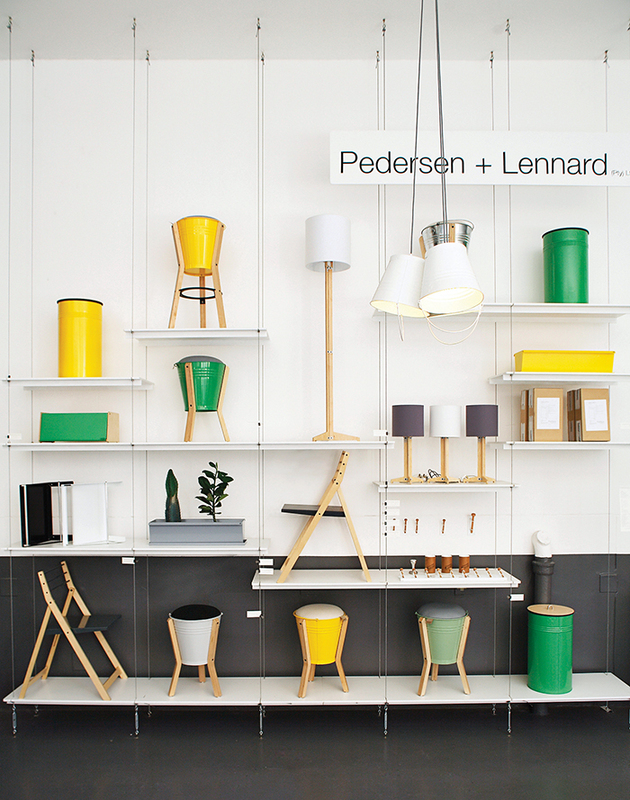 Pedersen + Lennard opened their third Field Office location in a residential section of Cape Town in June 2014. 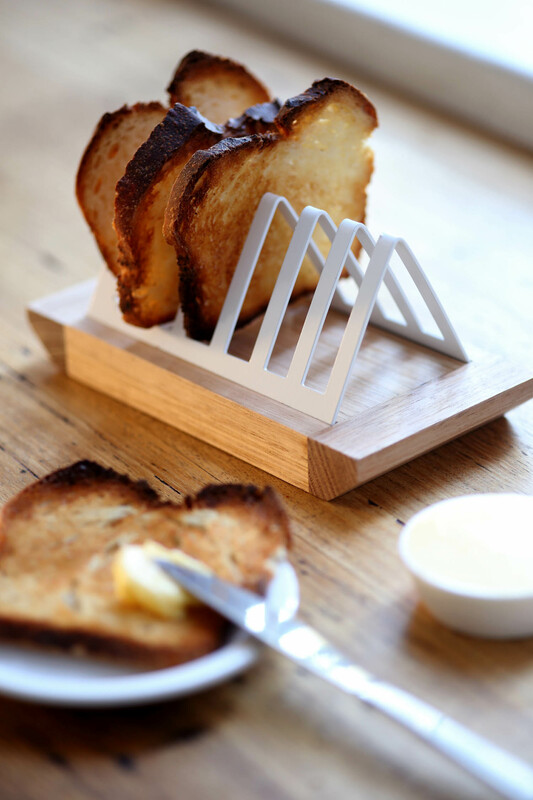 "We find ourselves in the marginal group who still love a simple slice of toast and decided to design something to emphasize this as well as solve a problem that hasn't been addressed for a good 20 to 30 years," Pedersen says of this toast rack. "The size and shape of bread has changed, and so we found that our old inherited toast racks didn't work anymore! Our solution is a simple combination of a wooden breadboard base with a steel or brass rack, which clips in nicely and holds toast [slices] of varying thickness." Another view of the newest Field Office location in the Woodstock district of Cape Town. "This piece came out of a need for a bread bin which carried our aesthetic into the kitchen space," Pedersen says. "Kitchens have become increasingly smaller; we are aware that it's precious real estate, hence the more compact size and the added feature of the lid flipping over to become a recipe book stand." "Inspired by the clean lines of Stockholm and its people," Pedersen says, "we decided to make a cabinet which sits neatly on a steel base to create a shadow (a reference to the old Victorian wardrobe bases) but has strong, thin lines visible. The result is a unit with a steel base and top, and invisible push-button mechanisms inside to avoid the need for handles." The Skagen Settle. "This piece is a combination of two ideas around our need for a timber-framed armchair," Pedersen says. "There is an old Cape-style settle at James' family farm on the West Coast which resonated with furniture from my own family heritage from Skagen, a seaside village in Denmark. The result is a piece which references both of these places for us and has a distinct mix of our forefathers and their approach to furniture." The original Field Office, in downtown Cape Town. The Huguenot Range. "James came up with a great new method for a modular table structure which utilizes a relatively thin steel profile while being incredibly strong," Pedersen says "As we began exploring this, we realized that the tapering leg reminds us of the old French Huguenot furniture, and decided to name the range after these pioneering people. We made the first bench in this range as a gift for my mother, who comes from a long line of French Huguenot farmers." The Huguenot Range has been expanded to include "a variety of tables, benches and stools in many shapes and sizes," Pedersen says. "We offer it in oak, ash, and wormy chestnut timber, with the frame being powder-coated" steel. The Glass Trestle table "explores the relationship between steel and wood to complement each other in a way that each material is intrinsically weak without the other," Pedersen says. "The wood is clamped between the steel, which in turn holds the structural steel that supports the weight of the glass as it spans. The manufacturing process interests us a lot as the parts are individually cut out and welded together, but the strength only comes when the parts are assembled. We've done a range of sizes for this table, from a small home office desk to a larger boardroom table." James Lennard and Luke Pedersen. Luke Pedersen and James Lennard share an easy rapport that betrays a close friendship forged on countless surfing excursions to Noordhoek, Elands Bay, and other points along the South African coast. To some degree, that laid-back sensibility has set the tone for Pedersen + Lennard, the thriving furniture-design business that they started in Cape Town in 2008. By 2010, successful but not yet able to afford a traditional showroom, Pedersen and Lennard struck upon a novel workaround: They opened Field Office, a downtown Cape Town coffee shop that doubles as a showcase and retail outlet for their furniture. They provided free wi-fi—a novelty in South Africa even now—and encouraged people to hang out and work or read. It did well enough that they opened a second one in the Woodstock Exchange, a collection of design boutiques and studio spaces in a former industrial center east of downtown Cape Town, setting up an adjacent office and factory where most of their 17 employees now work. The shops—including a third Field Office that opened in a residential part of Woodstock in June—have proved an effective way for Pedersen + Lennard to build a strong brand identity and a devoted customer base. Six years in, Pedersen and Lennard find themselves surveying a South African design landscape that’s much more fertile and crowded than it was in 2008. “When we started, our aim was to be cheaper than the existing guys but have our products still be of good quality,” Lennard says. “And we seem to have achieved that. But now we have to find our next point of difference.” Pedersen says that is likely to be a renewed focus on the South African market.